The Seneca Creek Greenway Trailhead may be found by following the tow path across the bridge over Seneca Creek and taking a right turn on the dirt road, the trail head. As you walk along this road, on the left is the old mill pond. When you come to a fork in the road, bear right past the old mill. You will see the red sandstone remains of this large stone cutting and polishing mill. It was built in 1837 and ran until about 1900. It was powered by a large turbine. The stone was used to construct the canal and for buildings in Washington such as the Smithsonian Castle. The quarry, used as early as 1774, is about a mile further up the canal. Continue along the road which leads to Tschiffley Mill Road (pronounced Shif-fay-lee). This dirt road parallels Seneca Creek out to River Road. At River Road, turn right and cross the bridge over the creek. Then turn left onto Seneca Road, which is opposite Riley's Lock Road. Fifty feet or so up Seneca Road you will see the the old trail on your left. Past that and continue another 300 yards or so to the new trail and trail sign on the left. At River Road and Seneca Creek there used to stand a four story wood frame flour mill. When River Road was rebuilt, around 1957, the mill was torn down and the road constructed over its site. 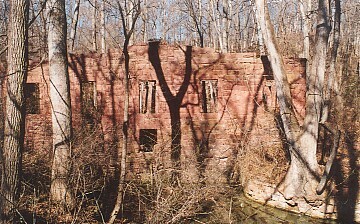 The mill, by that time, had been abandon for about 25 years. 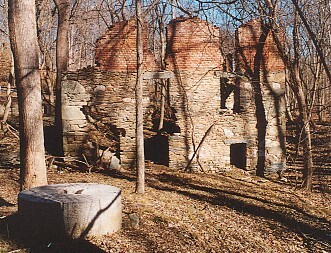 Remains of the mill run may still be seen behind the storage building just to the right of Pool's Store. In May 1861, the early days of the Civil War, General Charles P. Stone, stationed troops in Montgomery County to help guard the capitol. His first battalion was stationed at Seneca. The old trail starts off paralleling the creek. About a 1/4 mile up the trail is an area frequented by buzzards. This section of trail is occasionally soggy. At about .4 miles, the trail turns away from the creek and about a hundred yards later, starts to gain a little elevation. It passes through an area of large old vines. At about 1/2 mile down the trail, you cross a small stream in a gully. This is about where the new trail joins the old trail. The new trail is on higher ground and bypasses the soggy areas for those who chose to follow it. The trail then continues along the rolling woods at 5 or 10 feet above the flood plain. In another .1 or .2 miles, you cross another damp gully and climb about 40 feet into a growth of mountain laurel. The trail continues uphill another 15 or 20 feet and crosses the rolling wooded hillside of pine, mountain laurel and occasional patches of ground pines. At .9 miles, the trail drops down to cross another gully and then up the other side. After another tenth mile, the trail starts dropping down about 80 feet. At the bottom, it turns left and follows a small stream downhill. There are some large flat stones to cross the stream. In another tenth of a mile or so, you are at the parking area by the creek. The trail sign, by Berryville Road at the end of the dirt parking area, marks the start of this section of the trail heading north. If you want to head south, follow Berryville Road, which parallels a small stream, until you see a blaze for the trail. Looking far upstream from this trail head, you can see a diversion dam across the creek. It used to divert water into a canal that ran down to the vicinity of Poole's store where a mill was located. The trail starts out on a grassy road by the creek. After about a 100 yards, it turns away from the creek. Within a few minutes the trail enters a field being reforested. Trees are being grown within the tubes used to protect the saplings from the deer. The trail turns right and then left across the field. Blazes on the tree tubes and posts lead across the field to the trail's entrance in the trees. Cross the bridge there and bear right. The bridge is about 1/3 mile from the starting point. More tree tubes with blazes mark the trail. It proceeds to the right of a small group (5) trees towards the woods. At about 1/2 mile, the trail turns right and enters the woods. The trail then remains high on a hillside. It parallels a field on the right for a quarter of a mile after which it enters a cedar woods. About a third of a mile later a magnificent southern red oak may be seen on the left. With a circumference of eleven and a half feet, its estimated age is over 200 years. The trail then drops down a hill side and parallels a fence line. At about 1.5 miles from the trail head, the trail hits another field. It bears right and follows the edge of the field. Just before a slight rise in the field, the trail turns left into the woods. It climbs a slight hill and parallels the creek, 30 feet below. 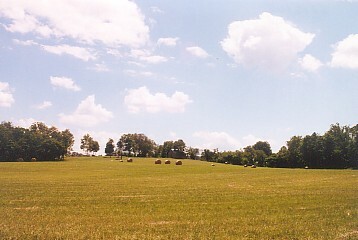 For the next 1/4 mile, the trail crosses the rolling hilltop. At 1.9 miles, it turns left, staying on the wooded hilltop. Shortly thereafter, it passes the edge of a field and then drops down to cross a gully (passing more piles of garbage). About a tenth of a mile later, the trail passes through some cedars and in another tenth, it joins the side trail coming from Berryville Road. The side trail may be found along Berryville road where it makes a sharp turn. At the turn, the woods ends and a field begins. There are no signs visible from the road but if you walk along the edge of the woods by the turn, you will find the trail. Follow this trail for a hundred yards or so until you hit the Greenway trail. This junction is easy to miss since the trail comes in at a sharp angle on your left and no blazes are visible from the side trail. When you start seeing the blue-green (teal) blazes, you will be heading north on the trail. If you want to head south, turn around and follow the blazes. Within a 100 yards of hitting the trail, you pass a horse jump across the trail. In the next .2 miles, the trail crosses a couple of small gullies and then gradually gains elevation as it crosses the rolling wooded hillside. At about .25 miles from the trail head, the trail drops down 15 feet or so and a couple of hundred feet later an unmarked trail comes in from the right, stay left. Another 200 feet and you cross another bridge. At about 3/4 of a mile, the trail enters scrub land, characterized by tall grasses, bushes, and small trees. A tenth of a mile later, you cross a bridge and the terrain becomes more wooded with a grassy floor. Another tenth of a miles and the trail is again by the creek. At a little over a mile, you hop across a small stream and enter a field. Go straight along the wooded edge of the field. The trail passes through a narrow line of trees that extends into the field. Continue straight along the edge of the field. After about .2 miles, the trail enters the woods. You quickly come upon a bridge across a wet gully. The trail then becomes a wide grassy path through small trees. The creek is just to the left. About .2 miles later, the trail turns right up a slight rise and 20 yards later turns left. The trail drops down a bank and crosses a bridge. A minute later, it crosses another bridge and turns left back to the creek. At about 1.7 miles from the trail head, the trail makes a sharp right turn and parallels the creek. It continues until it reaches the Route 28 bridge. The trail passes under the bridge and turns right on the old road that leads to the parking lot. The trailhead for this section is at the east end of the parking lot, near its entrance, and is marked by a Seneca Creek Greenway Trail sign. Exit the parking lot through the gap in the railing and proceed up the hill towards the telephone pole. A trail blaze is located on a post by the telephone pole guy wires. The trail parallels Rt. 28 along the edge of the field until it hits the tree line where another trail blaze on a post is located. Turn left at the tree line and follow along it. At about a quarter of a mile, it passes between a couple of trees and continues straight uphill. At the crest of the hill is another blaze on a post, follow the tree line over the crest and downhill. As you near the corner of the field, there is another blaze on a post marking a right turn into the woods. This is about .4 miles from the trailhead. In October, 1862, Lieutenant General James E. B. (Jeb) Stuart was returning from a raid in Pennsylvania when he hit Union patrols in upper Montgomery County. He posted lookouts on the ridge (on your right) while retreating to White's Ford. The trail continues along a wooded hillside and after two tenths of a mile, drops down to creek level where it crosses a bridge. 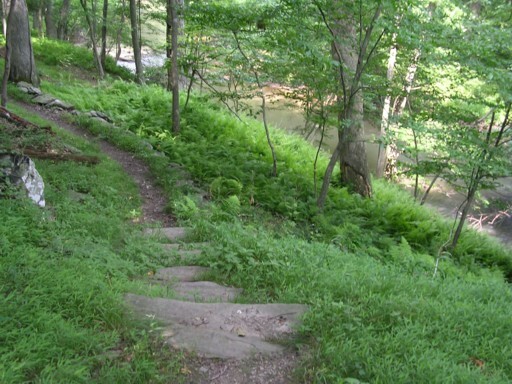 The trail then gains a little elevation as it continues along the wooded hillside overlooking the creek. At about .9 miles from the trailhead, the trail heads away from the creek to cross a bridge over a gully. Shortly thereafter, you pass by the edge of a pine grove. 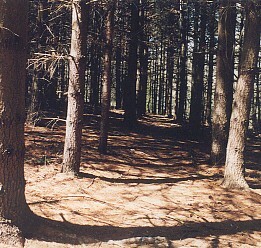 The trail crosses a narrow band of deciduous trees and then enters a pine tree tunnel. Coming out of the tunnel, you are about .2 miles from Black Rock Mill. The trail continues through the gentle rolling woods, traverses a cable clearing and 50 yards later hits the back yard of Black Rock Mill. 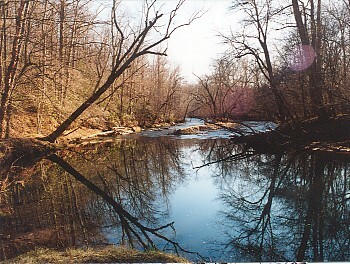 From the Black Rock Mill parking lot, cross the bridge over Great Seneca Creek to the trail sign on the right. 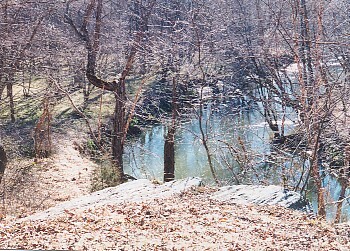 The trail stays along the creek for the first third of a mile. It then climbs up into the wooded hillside. There are a few switchbacks climbing up the 60 or 80 feet until you reach the top. Then there are gentle ups and downs until you drop down to a gully, where the trail turns right. This is about 3/4 mile from the trail head. 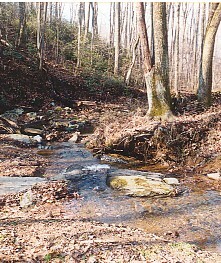 The trail goes downhill, following the gully, until it nears the creek. At that point, it crosses the gully on a bridge and turns left. About a hundred yards further, you start up a steep incline. There are switchbacks in the trail until you have climbed up about 60 to 80 feet to the top. This is about 1 mile from the trail head. The trail bears left and follows the ridge line down. About a tenth of a mile after the top, you hit a pine grove. The ground is fairly clear with lots of moss. The trail then bears left into the pine grove and goes up and over a slight hill. It drops down into a valley, crosses a small stream on a bridge and then goes up the other side to a forested area. A short distance later and you are at Route 118. This is a dangerous road crossing because the cars are traveling fast and there is a limited view in either direction. Be careful. This section is fairly flat and stays close to the creek. It is common to see deer. It starts directly across the road from the end of the previous section. After passing thru the trees lining the road, the trail turns right and follows the edge of the field for about 50 yards. It then drops down a bank and runs parallel to the road until it picks up Great Seneca Creek. After a little more that a quarter of a mile, you pass an open field on your left, then cross a bridge and continue following the creek. At about .9 miles, the trail tops an earth parapet which it follows for a tenth of a mile to the pipeline clearing. On the other side of the clearing, the trail again runs on top of a 5 foot high parapet. At 1 1/4 miles, you cross the power line clearing, then climb up on the parapet again as you enter the woods. A few large trees are also growing on top of the parapet making for narrow footing around them. At 1.4 miles, you are off the parapet again. Sounds of gun fire can be heard in the distance from the nearby shooting range. At about 1.7 miles the trail follows the creek around a sweeping bend. Two tenths of a mile later, the trail goes up 25 feet to the top of a small knoll where a rocky outcropping overlooks the creek. A tenth of a mile later you hike to the top of a second small knoll. The trail is then level and follows the creek for the remaining half mile to Riffle Ford Road. After coming to Riffle Ford Road, from the previous section, cross the road and turn right. Cross the bridge over Great Seneca Creek and turn left up the gravel road. Follow the gravel road for about 1/4 mile to where you will cross four large culvert pipes containing Long Draught Branch. You then come to a sign for the wetlands area. Bear right and follow the trail past the wetlands viewing stand. The trail then enters the woods and goes over a slight hill before passing under Great Seneca Highway. A tenth of a mile later is the junction with the white blazed Mink Hollow Trail coming in from the right across a wooden bridge. Continue straight past that trail to another trail junction about another tenth of a mile up the trail. There bear right on the Long Draught Trail and within a few hundred feet, cross over a wooden bridge. Continue for about .2 mile where you pass two benches by the stream. The trail continues to follow Long Draught through the woods on fairly level terrain. After another tenth of a mile, the trail starts to go up. After a series of switchbacks, and an elevation gain of 50 or 60 feet, the trail comes out on a road. Go directly across the road. This is the side road to the picnic area, not the main road across the dam at the end of the lake. After crossing the road, you will see a sign "Great Seneca" marking the trail. The trail now has orange and teal blazes. A hundred feet down the trail is Bill's Bench. The trail now goes downhill a short ways and then turns right and contours across the hillside for about .1 mile then passes through some mountain laurels. It crosses the rolling side hill and comes out on the power line cut. The trail bears right along the power line cut. About a tenth of a mile later, a side trail comes out on the right. Continue straight along the cut and drop down to where you cross a small stream. The Old Pond trail comes in on the right. It is a short cut to the Park Office. The trail crosses the power line cut and enters a pine woods. A short distance later, it crosses a second clearing, enters the woods again, bears left and drops down to the creek. About .2 mile further, one may see the remains of the Clopper Grist Mill through the woods, across the creek towards Clopper Road. 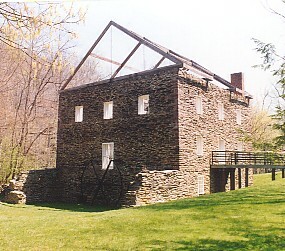 This mill was built by Francis Clopper in 1834 to replace an earlier mill. It ground wheat, corn, barley, and rye. It was destroyed by fire in 1947. (Note: if you have time to visit the ruins, there is a great example of a mill stone there) After another .2 miles, one crosses some smooth rocks and then turns right, just before a stone wall. A few paces up the trail is the trail junction. Turning left will take you on the Greenway Trail towards Route 355. Going straight will take you to the Park Office parking lot. It is about 1/4 mile further up the trail. This section is slightly rolling and wooded. Because of its proximity to major roads, for most of the trail there is the din of traffic. A couple more hundred yards up the trail, you go directly across a gravel road and by the tree with the Izaak Walton sign. The trail then rises slightly and enters the woods paralleling a pipeline cut. The trail circles behind the Izaak Walton pond and at about .9 miles drops down beneath the railroad bridge. At about 1 mile, the trail goes up seven stone steps and through the center of what was once an enormous tree formed by three huge trunks. The trunks are now on the ground radiating from this spot. Make a wish. The trail meanders away from the creek and at about 1.5 miles, it drops down near Game Preserve Road. After crossing a small stream, the trail makes a sharp left turn, then parallels Game Preserve Road for about .4 miles. Just before the Route 270 bridge, there is a trail junction. Take the trail that drops down to the creek level. It leads to stone stairs that lead up and under the bridge. After passing under the bridge, the trail switch backs down to the creek again. It passes a small pool on the right. At about 2.1 miles you pass a rusty piece of farm equipment, a manure spreader. At the Route 355 bridge, pass under it and then hike up a steep, grassy embankment past the telephone pole. There is a step along the wooden guardrail to help you climb over it. Take the sidewalk across the bridge to the gravel parking area.